Okay. So let’s be real. 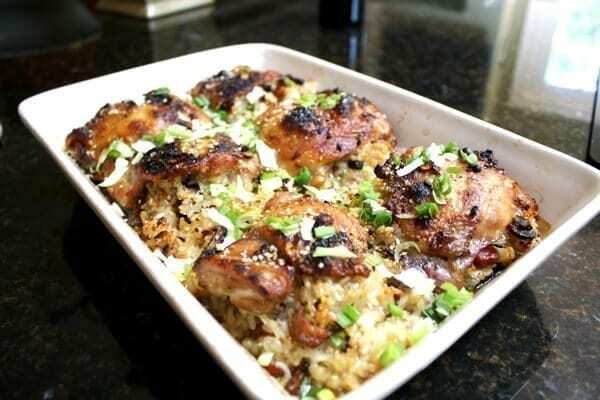 I LOVE this chicken with sticky rice. I pine for it. I request it often. 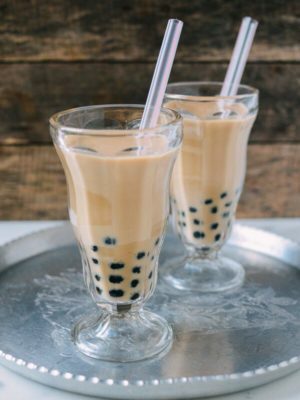 I’ve always depended on my dad to make it, since I had no idea how to make it myself. And that was kind of tragic, especially since he’s thousands of miles away at the moment. But no more, my friends. No more. Finally, here is the recipe, written out for all to enjoy, courtesy of my dad, the maestro of all things sticky rice. And I have to tell you that I made this for the first time by myself the other day, and man, was it good. Surprisingly simple, too. 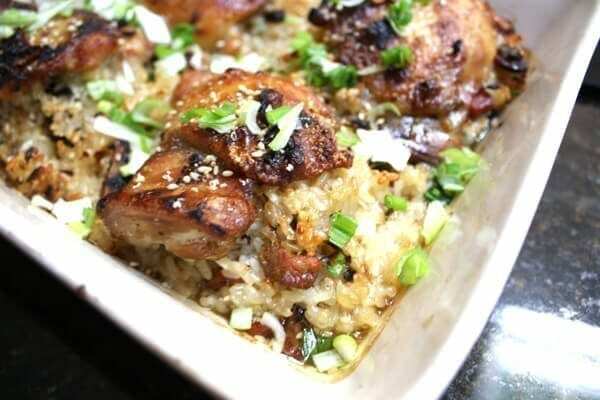 Basically, you take chicken thighs and marinate them in all sorts of wonderful things like garlic, shallots, scallions, five spice powder, rice wine, and soy sauce. 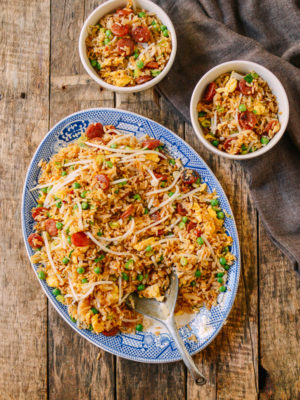 THEN, you make a batch of ooey gooey delicious sticky rice with shiitake mushrooms and maybe a little bit of Chinese sausage. 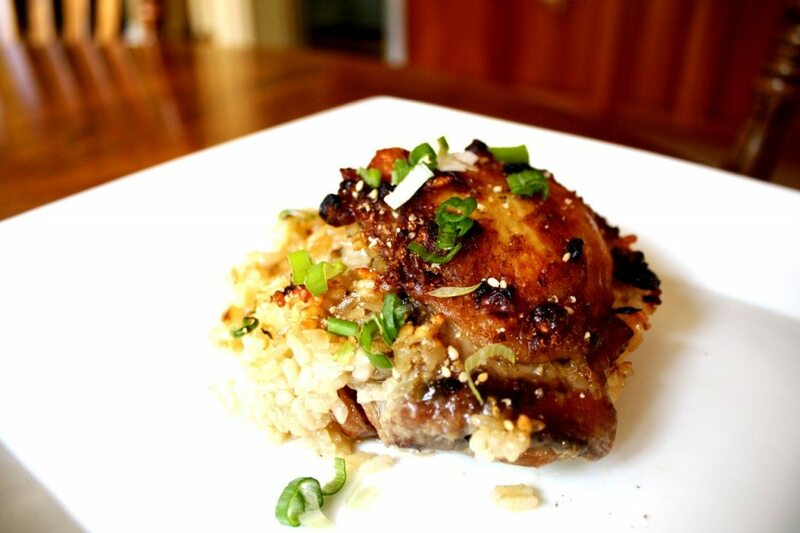 Scroll down for the complete roasted chicken with sticky rice recipe. Here’s the step-by-step. 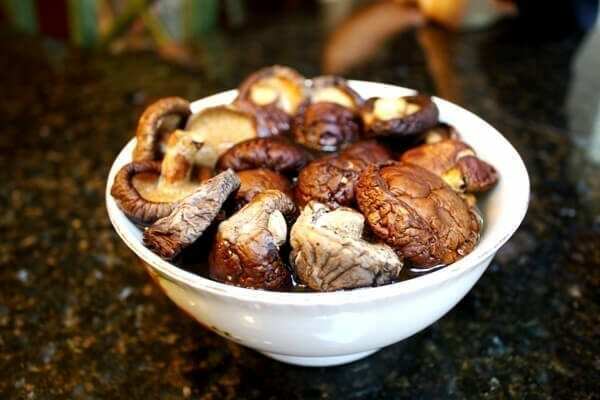 So the very first thing you want to do is soak your mushrooms in hot water. 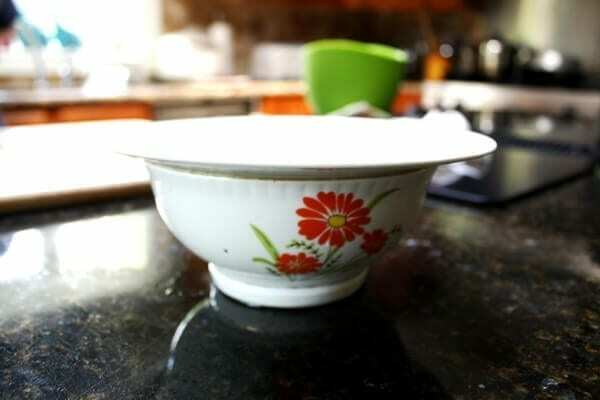 A good trick to use is to put a plate over the bowl to make sure that everything is submerged. Soak these for an hour or two, until they’re nice and soft. Then you’re going to want to slice and dice everything, including the shallot, garlic, onion, scallion, sausage and mushrooms. 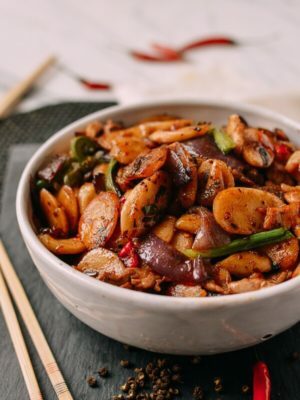 Then combine the shallot, garlic, 1 1/2 tablespoons of the soy sauce, wine, five spice powder, and sesame oil into a stainless steel or glass bowl and add the chicken, making sure to coat it well with the marinade. Let it marinate in the fridge for an hour or two. Then it’s time to cook the sticky rice. 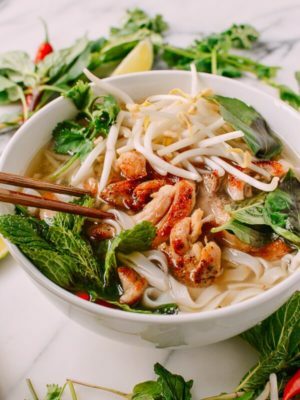 There are several methods you could use, but if you have a rice cooker, then it makes things easy. Sticky rice needs very little water to cook; just follow the directions for sticky rice on your rice cooker and you should be fine. 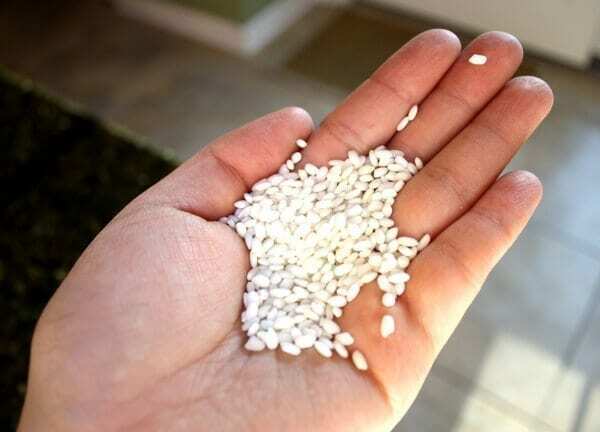 (You may have heard that you should let the rice soak overnight before cooking. For this dish, that step isn’t necessary). Once the sticky rice is cooked and the chicken is almost done marinating, heat a wok or large skillet over medium heat and cook the onion in a bit of oil until translucent. 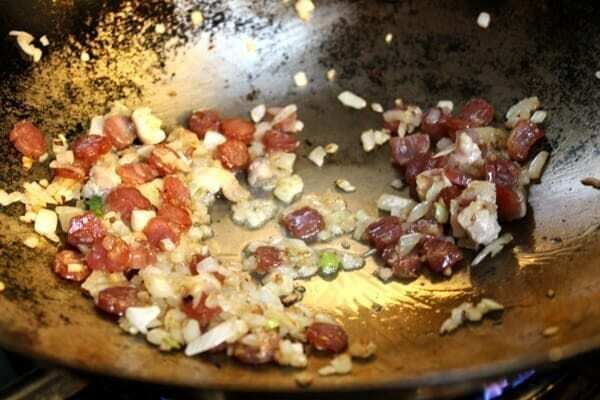 Then add the Chinese sausage and stir fry for another minute. 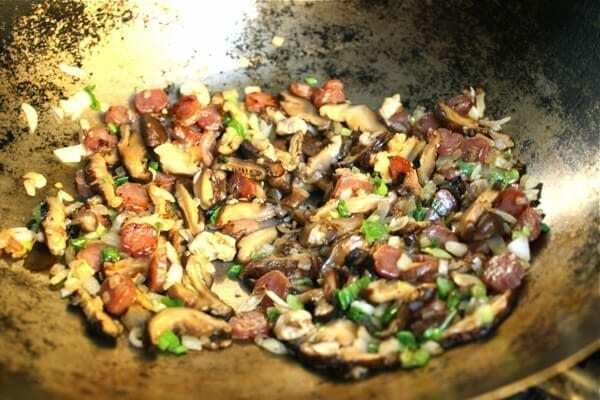 Then stir in the mushrooms and scallion. 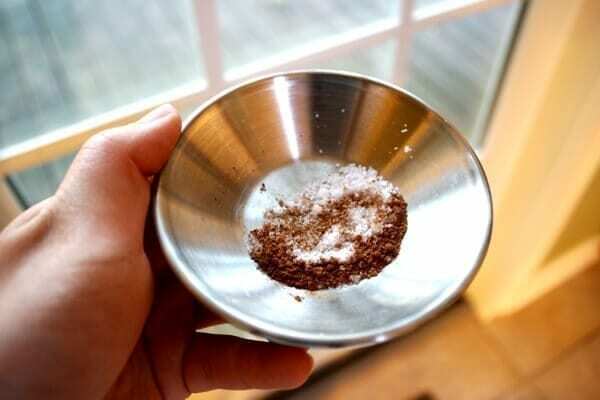 Season with salt and ground white pepper. Cook another minute and add in the cooked sticky rice, 1 teaspoon of salt, and the last 1 teaspoon of soy sauce and mix thoroughly. Take the rice out of the pan and let it cool off a little. Try not to eat too much of it while you’re waiting. Preheat your oven to 375 degrees. 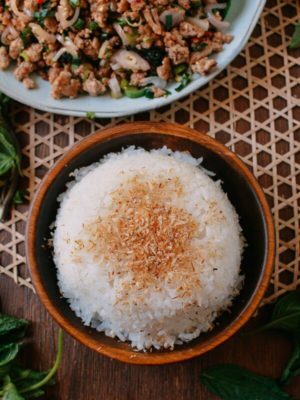 Take your chicken and wrap each piece around a ball of sticky rice, tucking all sides under. Lay it in a baking dish. Repeat until all the chicken and sticky rice is finished, and arrange the pieces close to each other. Add about 2 cups of chicken broth to the baking pan and reserve the rest if needed during baking. Then combine ½ teaspoon of salt with ¼ tsp of 5 spice powder, and sprinkle a dash of the mixture over the top of each chicken portion. Bake for about 35 minutes, and add additional broth if the bottom of the pan if it looks dry. Watch it closely, as you don’t want it to dry out. Once the meat is cooked through, broil it on low for 2-3 minutes until the skin is golden brown and crispy. Serve this roasted chicken with sticky rice all by itself! 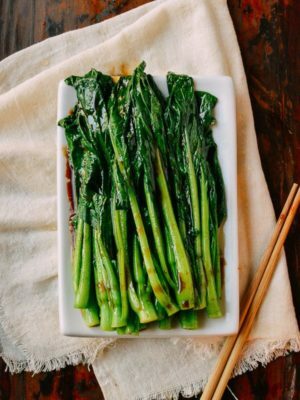 Maybe add a side of stir fried bok choy to balance the dish out. 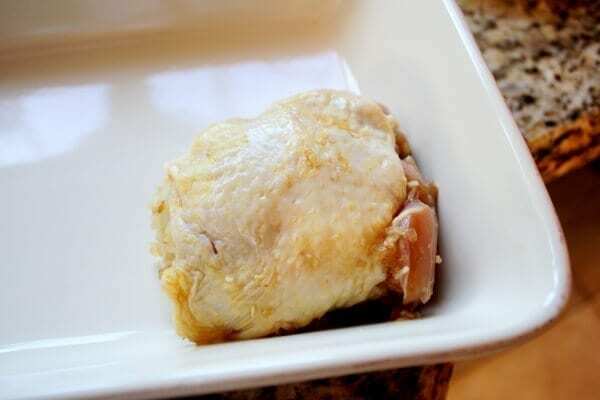 This roasted chicken with sticky rice recipe uses all sorts of wonderful things like garlic, shallots, scallions, five spice powder, rice wine, and soy sauce. 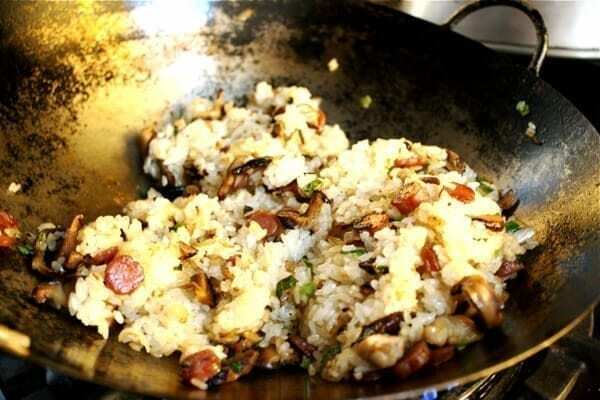 Add ooey gooey delicious sticky rice with shiitake mushrooms, a little bit of Chinese sausage and you have a party! 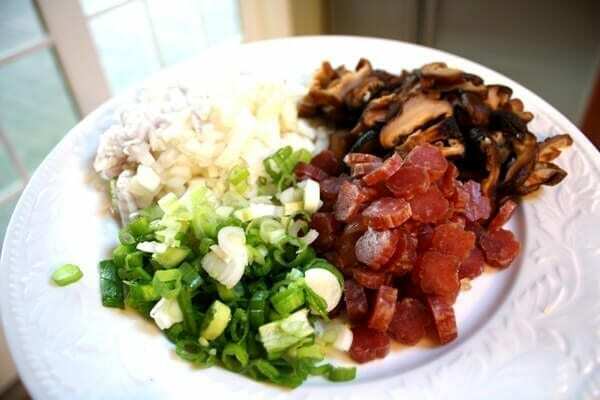 Make your preparations first, soaking the mushrooms and chopping the onions, garlic, shallot, and scallion. 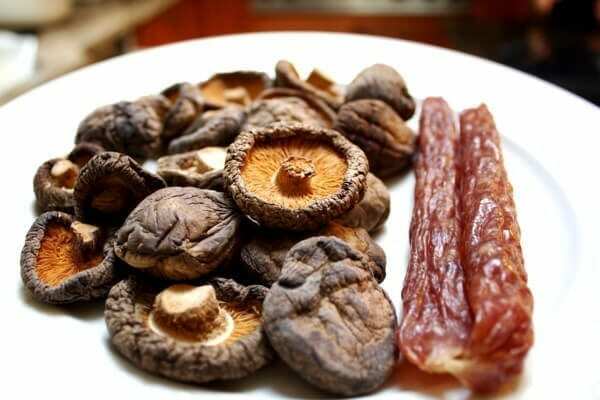 Cut the sausage into small discs and slice the mushrooms (after draining) lengthwise into thin strips. 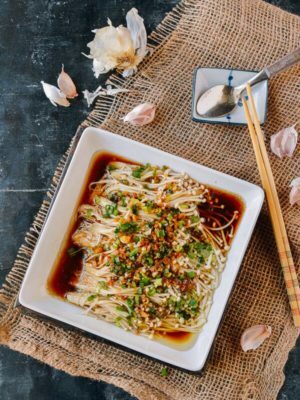 Combine the shallot, garlic, 1½ tablespoons of the soy sauce, wine, five spice powder, and sesame oil into a stainless steel or glass bowl. 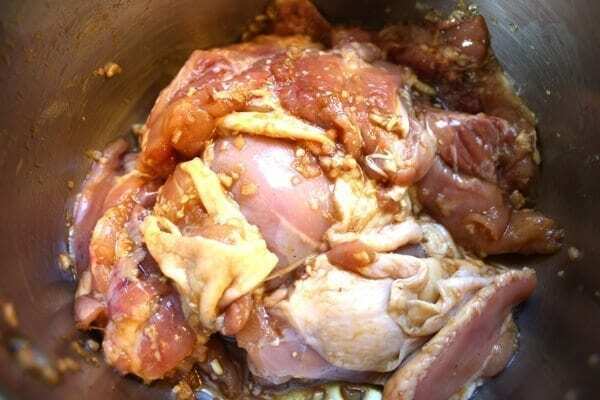 Add the chicken to the mixture and coat it in the marinade. Cover with plastic wrap and transfer to the refrigerator to marinate for 1 to 2 hours. Follow the directions on the package for cooking the sticky rice. 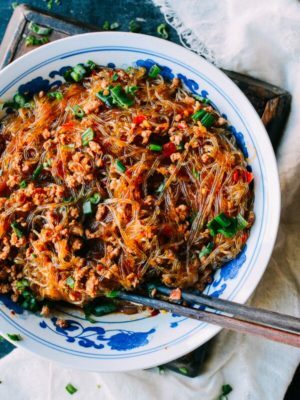 Use a rice cooker to make things easy. 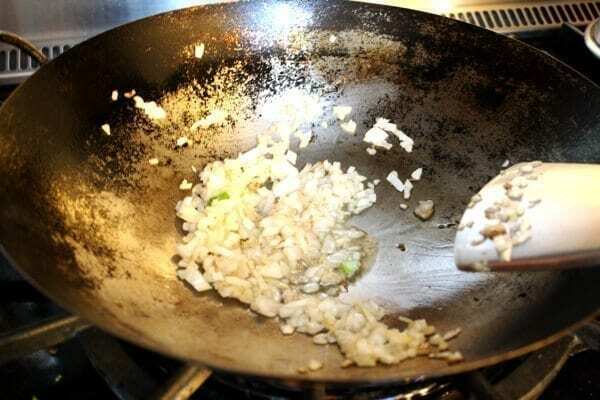 Heat a splash of oil in a wok using medium heat, and cook the onion until translucent. Add the Chinese sausage and cook for another minute. Then add the shiitake mushrooms, scallion, salt and ground white pepper. 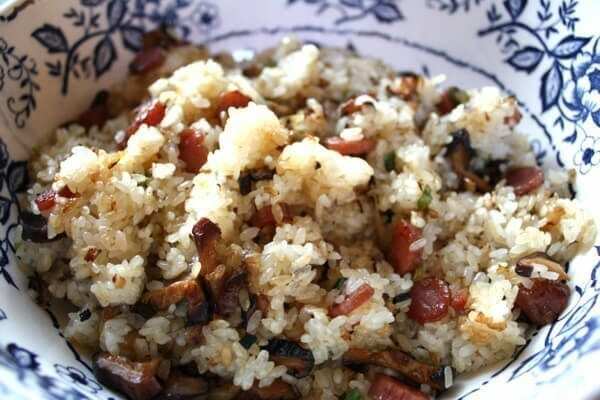 Cook another minute and add in the cooked sticky rice, 1 teaspoon of salt, and the last 1 teaspoon of soy sauce. Mix thoroughly and take the rice mixture out of the pan to allow it to cool off. 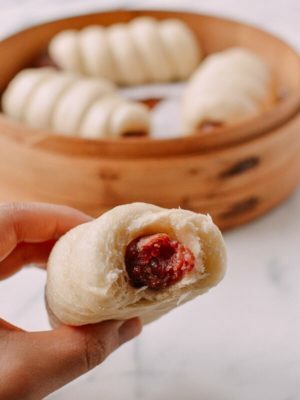 Preheat oven to 375 degrees, Make six small rice balls – about ⅔ cup and wrap a chicken thigh around each portion, tucking all sides under. Lay them in a baking dish. Add 2 cups of chicken broth to the baking dish and reserve the rest if needed during baking. Combine ½ teaspoon of salt with ¼ tsp of five spice powder, and sprinkle a dash of the mixture over the skin of each chicken portion. Bake for about 35 minutes, and add additional broth if the bottom of the pan looks dry. Watch it closely, as you don’t want to overcook the chicken. Once the meat is cooked through, broil it on low for 2-3 minutes until the skin is golden brown. Don't walk away as it broils! Watch it like a hawk to prevent burning. 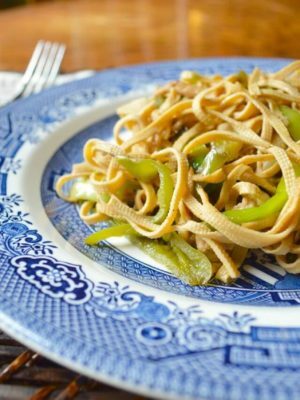 Serve immediately, and garnish with toasted sesame seeds and chopped scallions if you want to go festive! Wow, so tasty! 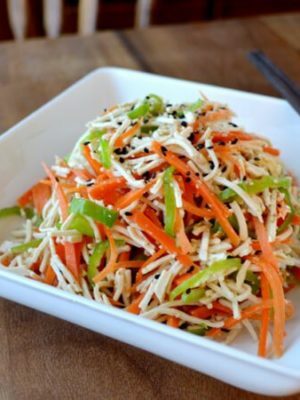 My husband and I loved it and my son devoured the rice. So glad you guys liked this, Odessa! 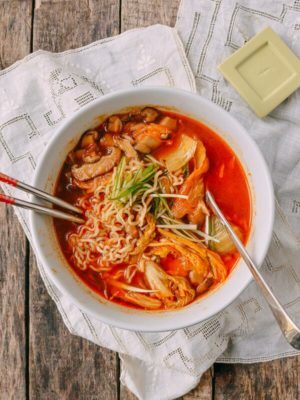 Tried this recipe last night and it was a hit! After cooking the sticky rice my husband tasted it and would not stop eating it. My 3 year old who is very picky asked for seconds. 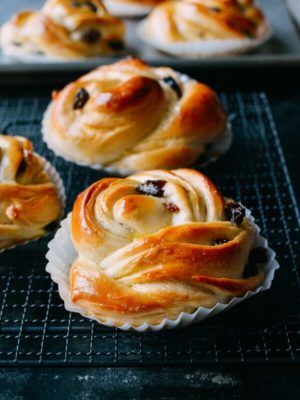 Thank you for sharing your recipes. What can you sub for the shaking wine? 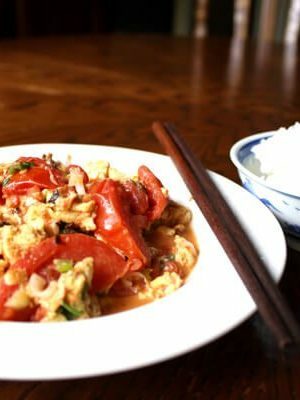 Hi Stu, you can substitute a dry cooking sherry if you can’t find Shaoxing rice wine. 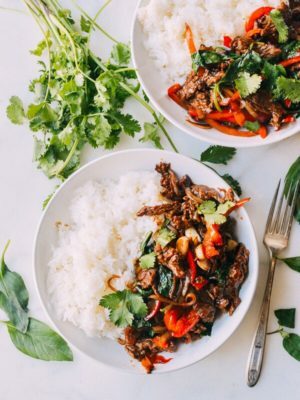 Hey CK, check out this helpful article: http://www.tablespoon.com/posts/how-to-make-sticky-rice-at-home/8109b0e4-ac06-4a0a-aa7f-50d5bcfe3cb9. Great recipe. My boyfriend loved it. Said the sticky rice reminds him of lo mai gai. 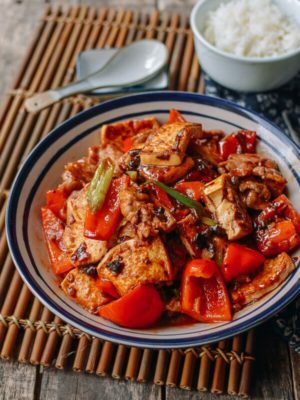 Hi Nadia, That’s exactly what the desired outcome of this recipe is – a simple luo mei gai! Glad you guys liked it! Tried this out tonight. I did not have sticky rice so I used jasmine and subbed char sui for the sausage. The results were delicious! I will be trying more of your recipes in the future. Thank you for making tonight’s dinner a success. Hi John, way to improvise with what you have. Happy cooking! Can’t wait to try your recipes thanks for sharing. I really like your website! Thank you so much! Please let us know how you like it. 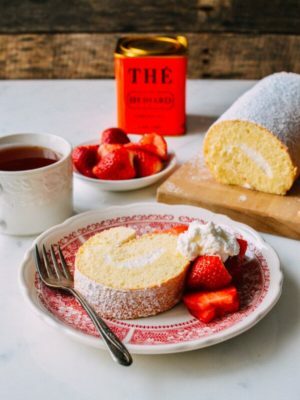 Hello, this recipe looks amazing. I was wondering if you’ve ever tried steaming it? This looks and sounds so good!! I’m definite going to make this. I love the flavor if lean Chinese sausage and 5 spice is heavenly. I ended up making my own blend as the stuff I found sold never included Szechen peppercorns – absolutely necessary. 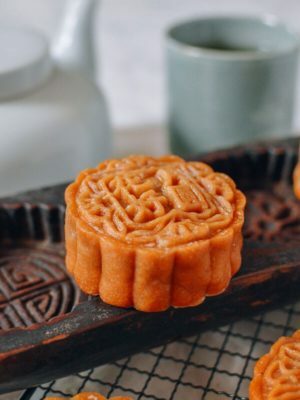 I almost always use sticky rice as I prefer its taste and how well it sticks together. I don’t have a rice cooker but I soak my rice before cooking. I find soaking it for maybe 1 1/2 hours until it’s no longer translucent is all that’s needed. Not overnight. 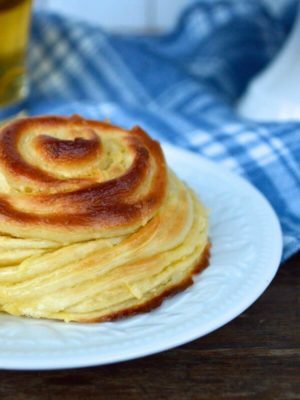 Thanks again for this yummy recipe! Thanks for the insights Jude! 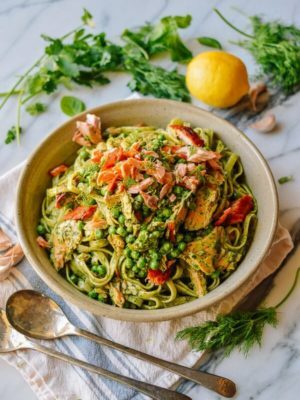 This looks so good and a dish my family would love to try! Found you at Show Stopper Saturday and now following on FB and Twitter. Pinning this, can’t wait to try, thanks! Hope you like it Bernadyn!